Steven (Chicagoland, United States) on 12 November 2010 in Architecture and Portfolio. View of the interior ceiling in the main exhibition space of the Milwaukee Art Museum. 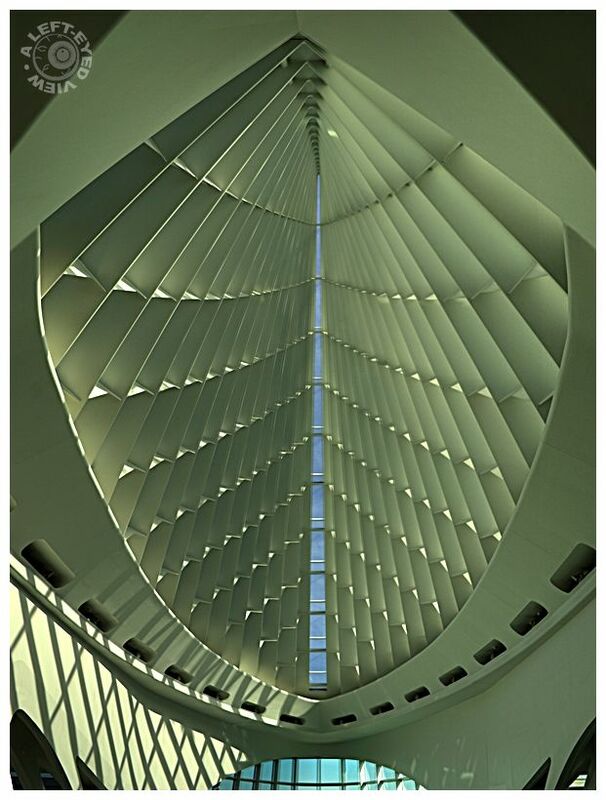 The Milwaukee Art Museum (MAM) gained international recognition with the construction of the white concrete Quadracci Pavilion, designed by Santiago Calatrava (his first completed project in the United States), which opened on May 4, 2001. The structure contains a movable, wing-like brise soleil which opens up for a wingspan of 217 feet during the day, folding over the tall, arched structure at night or during inclement weather. The brise soleil has since become a symbol for the city of Milwaukee. That is very cool. It seems like the inside of a group of sails. Excellent shot. Excellent shot.. love the lines and curve. beautiful lighting. Beautiful symmetry and fantastic light! Une très belle prise de vue graphique !! excellent framing. love symmetry ! BRAVO ..... a brilliant architectural rendition of this building. The symmetry, the sparkling light, the shadow lines... are all pure perfection. And thank you, too, for the wonderful description of this gorgeous building !! Wow an excellent frameup.. well done!! !